PaperWritings rewards you when you refer someone to our website. 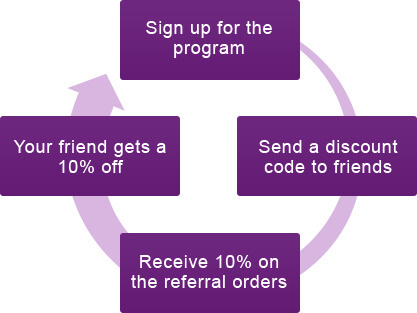 Thanks to the special program, you can earn 10% on all your referrals orders. Your friends will get a 10% one time discount. We would like to meet your friends, and we will thank you for introducing them to us! Create your own account by registering. Find the referral code in your personal account. Invite your friends to try out our service and share the code with them. The promo code gives your friends a 10% discount, and it will give you the opportunity to earn 10% on all your referrals. Join the program today to start making money! Is the promo code just for my friends, or can I use it as well? It is your friend who will be able to benefit from the promo code. However, you can save money with our discounts. See the full list here. Will my friend be able to use the code with each new order? This is a single time code. However, you can benefit from other discounts we offer. This page has all the information about our discounts. How do I know if I am making money? When you go to your personal account at PaperWritings.com, you will see all the details about your earnings in the section “Referral Program”. I would like to make a withdrawal. How can I do it? All you need to do is to let us know about it by sending an email to support@paperwritings.com. The minimum amount you can withdraw is $100, and we must receive your request not later than four days prior to the payment, which is usually made between the 16th and the 20th day of each month. Can I withdraw my money to PayPal? Yes, you can. We can also send it to Skrill or Webmoney.